I’m obsessed with the blog Fed Up With Lunch: The School Lunch Project. 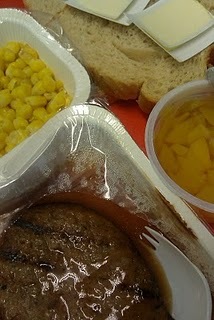 The unnamed blogger is a teacher who is eating and photographing school lunch at her school every day. It’s powerful, seeing the actual evidence of what our kids are being fed — sometimes I literally feel like vomiting at the pictures. And hoo boy, all the extra packaging is disheartening too. The teacher also has smart commentary about how kids actually eat; she’s noticed that small kids can’t peel and section an orange in the brief time allotted them for lunch, for instance. I’d never have considered that. I might have kvetched about orange slices causing unnecessary packaging and cost (like a lot of parents, I’ve griped about the preservative-dipped apple slices in NYC kids’ lunches) but if kids don’t touch whole oranges because they’re too hard to peel and take too long to eat, that’s so worth knowing and addressing! (And I wonder if I asked my own kids, whether they’d tell me they find whole apples daunting and they prefer slices. At home, they always want me to slice their apples. It just never occurred to me that kids might be more willing to eat apple slices than whole apples.) As I’ve said before, I think the issues around serving healthier school food — particularly in a giant system like NYC’s — are complex. So it’s great to have someone in the trenches every day reporting back. And the blog has clearly struck a real nerve, so I’m clearly not alone — the mysterious Mrs Q has zillions of followers now and has said repeatedly that she’s terrified of losing her job if she’s actually unmasked. Rock on, brave blogger-teacher lady! We appreciate you! I know some fat activists didn’t like this post (which originally had more inflammatory blame-the-fatties language and still has a whiff of judginess to it) but I think her basic point is legit: we should be focusing on getting all kids to eat more healthfully, not on shaming the wee pudgeballs.